Bonds vs. equities: What value do they add to an investment portfolio? A rally in Asian markets stuttered on Wednesday, with early gains pared as the US-China trade row erodes investor confidence. Wall Street had provided another strong lead with the Nasdaq approaching a record high, while energy firms in Asia pressed on with their rally following more gains in oil prices. But after two days of gains across the region, Asia could not maintain its morning momentum and key markets were mixed in the afternoon, despite forecast-beating Chinese trade figures. Tokyo ended 0.1% lower, Shanghai shed 1.3% and Singapore was down 0.8%, while Wellington was also off. Hong Kong ended up 0.4%, Sydney closed up 0.2% and Seoul put on 0.1%, with Taipei, Manila and Jakarta also higher. After months of tensions, traders remain on edge for any new developments in the trade saga involving the world's top two economies. On Tuesday the US said Donald Trump's 25% tariffs on a further $16bn of Chinese goods would kick in on August 23. That is on top of the measures imposed on $34bn of imports last month. The White House has also lined up another $200bn in Chinese imports to target in future. Kerry Craig, global markets strategist at JPMorgan Asset Management in Melbourne, said the trade row was the biggest risk to the global economy, adding: "We don't expect it to fade any time soon and we do think it's a big worry about the sentiment it creates in the markets." Still, China released figures showing its trade surplus with the US dipped only slightly in July. Globally its exports rose a better-than-forecast 12.2% and imports surged 27.3%, also beating expectations. 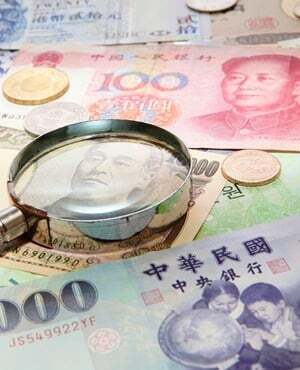 The yuan got some support after a Bloomberg News report said the Chinese central bank had emphasised the need for currency stability to the country's lenders as it looks to halt a slide in recent months. It said officials called on them to prevent "herd behaviour" and momentum-chasing moves in the forex markets, fearing a run on the yuan similar to 2015 to 2016. This hammered the unit and sent global markets into a tailspin. The report comes after Friday's move by the People's Bank of China to make it harder to bet against the currency. "This move is consistent with what the PBoC did earlier - it can be considered as preemptive efforts made to slow the yuan's depreciation, prevent one-sided bets on weakness and avoid a sense of panic," Eddie Cheung, Asia foreign-exchange strategist at Standard Chartered in Hong Kong, told Bloomberg. Energy firms remain popular as oil prices rise on worries about the trade row and a drop in Saudi Arabian output. Prices also got support after the US reimposed a first round of sanctions on Tehran after leaving the nuclear deal, with an embargo on the country's crude exports in November. Trump warned other countries against doing business with Iran in the face of the sanctions, saying they would be barred from trading with the United States. "The entreaty of the Americans that anyone who will do business with them (Iran) won't be able to do business in the US is something to watch," said Greg McKenna, chief markets strategist at AxiTrader. In early European trade London dipped 0.1%, while Frankfurt and Paris each fell 0.2%.